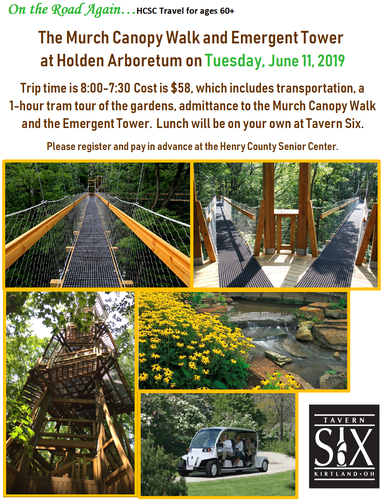 On the Road Again...HCSC travel for ages 60+ is traveling to Kirtland, OH to see the Murch Canopy Walk/Emergent Tower/and Holden Arboretum. Participants will get transportation, a 1-hour tram ride through the gardens, and admission to the canopy walk and emergent tower. Cost is $58 with lunch on your own at Tavern Six. Please register and pay in advance at the Henry County Senior Center. The bus will leave Henry County Senior Center at 8:00. Tuesday, June 11, 2019 Trip time is 8:00 - 7:00. Henry County Senior Center 419-599-5515 or Jan at 419-337-5101. Cost is $58 with lunch on your own.